FlavRx was voted first place for best vape cartridge at the 2016 Hempcon in San Francisco. They also won first place for best edible with their lemon chocolate bars. Because marijuana legalization and regulation is constantly evolving, it’s challenging for extraction and oil production companies to keep up. Oregon was one of the earliest states to legalize cannabis and also pass strict regulations for commercially sold cannabis. FlavRx is proud to be one of the first cannabis brands to meet compliance requirements and be legally sold in the state. 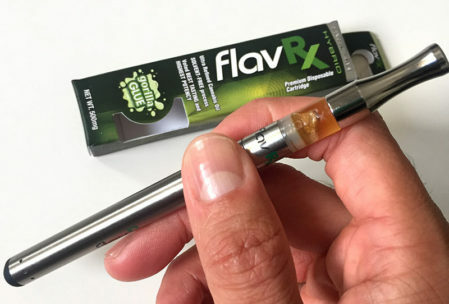 FlavRx continues to branch into other states across the U.S.
FlavRx uses a very specific technique to create their unique cannabis oil. First, purified raw cannabinoids are compiled by way of a solventless process. Raw cannabinoids are use to minimize the exposure to inhaling unwanted fats and waxes that may lead to conditions such as lipid pneumonia for patients. Unique terpene blends are then composed using food grade components and prepared based on actual strain data. Those terpene blends are added to the cannabinoids creating the final product. The final product is 100% solvent-free and contaminant-free. 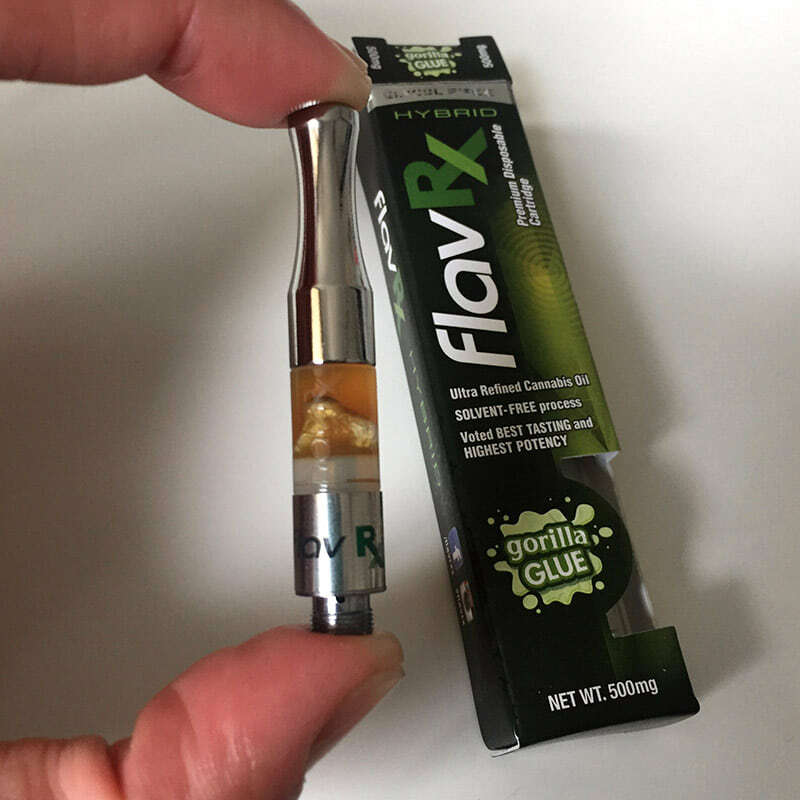 FlavRx vape cartridges come in two sizes, half gram (0.5 ml) and one full gram (1 ml). 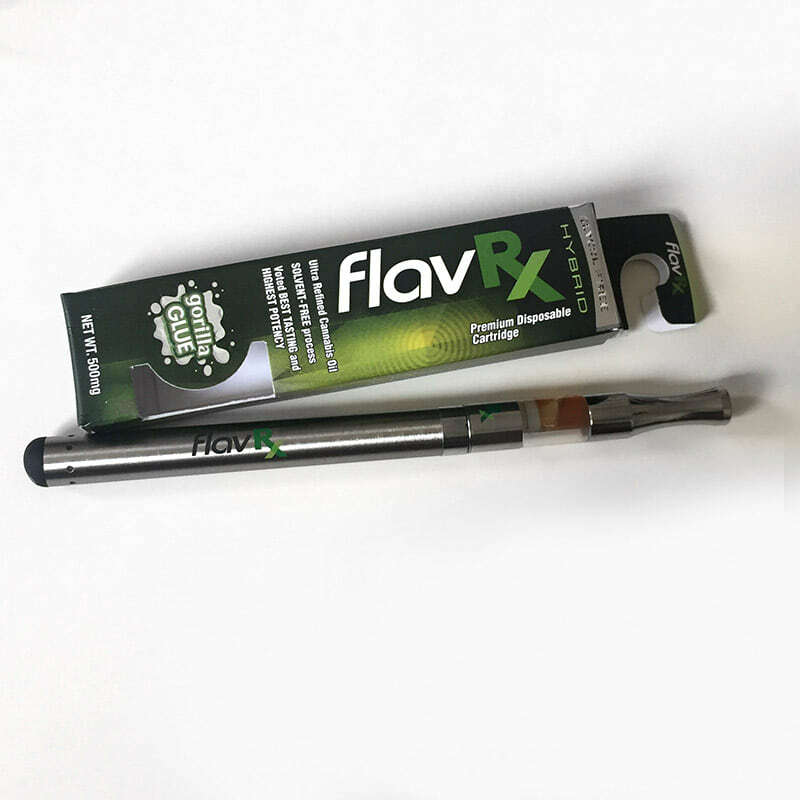 FlavRx cartridges are available in a large variety of indica, sativa and hybrid strains. 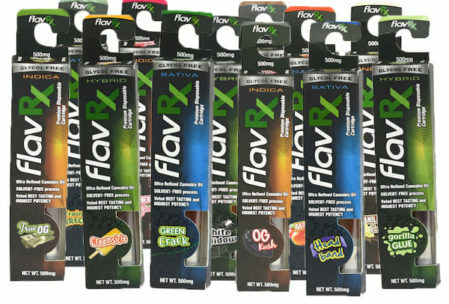 See the full list of FlavRx strains. We had the privilege of trying out a 0.5 ml OEM FlavRx cartridge. The 500 mg pre-filled vape cartridge is designed with a sleek silver mouthpiece, clear tank and compatible with the universal 510 threaded vape battery. Each vape is packaged in a tiny, colorful box. Aside from the flavor/strain and size, there’s not much info on the package. 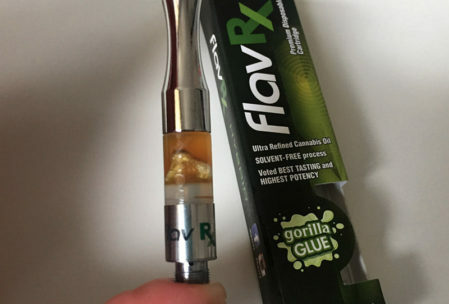 We had the chance to try the FlavRx Gorilla Glue vape cartridge with a FlavRx battery. The taste of the Gorilla Glue cannabis oil was identical to smoking the actual flower of Gorilla Glue strain. Quality Gorilla Glue tends to be extremely smooth, with an earthy aroma and lemony-citrus flavors. The cartridge invoked a nice tranquil, laid-back feeling, without inducing that struggling, couch-locked high. The buttonless vape pen battery is a lustrous silver. It has a storage capacity of 280 mAh, includes a USB-recharger, and fully recharges in about four hours. Nothing fancy. It’s similar to your standard 510-threaded vape battery. 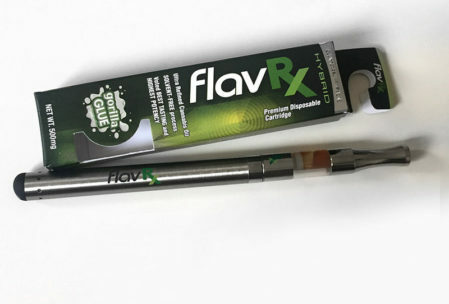 FlavRx concentrates are available in California, Oregon, and Washington. These cartridges typically range between $35-65. 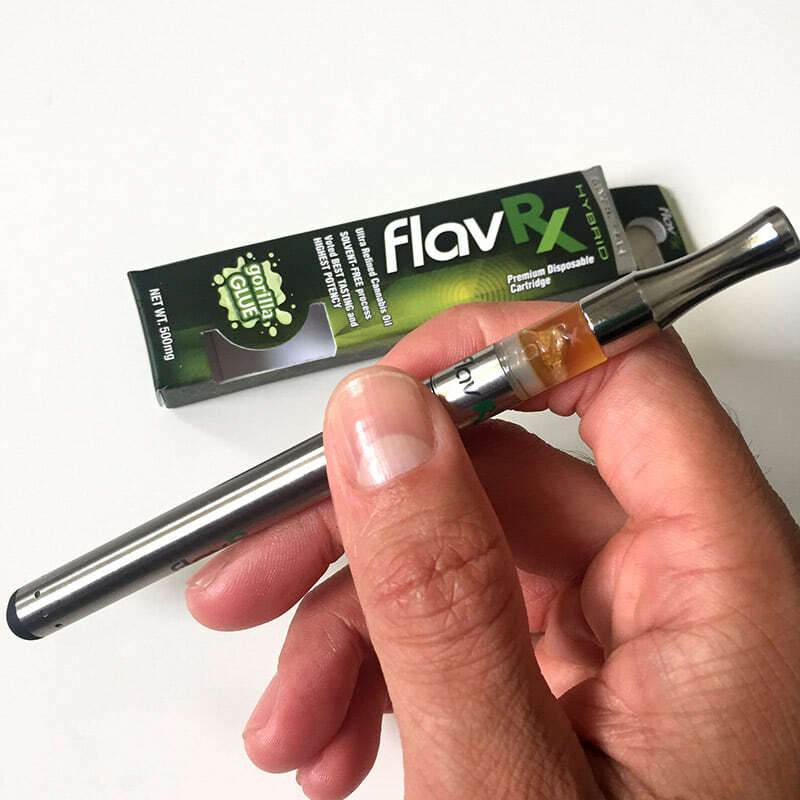 You can find FlavRx cartridges in over 100 dispesaries on WeedMaps and delivery services in Los Angeles. Need a vape pen battery to go with your cannabis oil cartridges? Find a low cost vape pen here. I just happen to buy one of these, but the disposal because I was in a pinch and the shop didn’t have an Stiiizy in. Anyway, I can’t get the pen to work. Has anyone else had this problem any suggestions? tasted gross burnt and oily. did not produce any effects at all… is there any THC in it?? ?